The crisis in Syria today – how should the Left respond? The devastation facing the people of Syria is appalling. After two and half years of war, there are over 100,000 dead, 2 million refugees that have fled the country and are registered with the UNHCR while another 5 million are ‘displaced’, all this out of a population of just 21 million. There appears to be no quick end in sight to the war. It all started in the town of Daraa on the 6 March 2011 when young boys were arrested, tortured and killed for writing ‘the people want to overthrow the regime’ on walls across the city. The people of Daraa turned out into the streets to protest at this outrage, and demonstrations spread to cities across Syria, all demanding the release of political prisoners, the abolition of Syria’s 48-year emergency law, more freedoms, and an end to pervasive government corruption. These were immediately and severely repressed by the Syrian army who shot at and killed the unarmed protesters. Like other countries of the Middle East and North Africa, the revolt did not come out of nowhere. If it was the killing of the youth in Daraa which sparked off the revolt, it had been brewing for years. The Assad regime, like those of Mubarak in Egypt or Ben Ali in Tunisia, has been implementing neo-liberal policies of the IMF and the World Bank. There is a massive level of poverty and unemployment, endemic corruption, and a despotic ruling elite that is enriching itself. Just as for the other countries of the region, the Left had to give its support and solidarity to those fighting repression and poverty. The long-term underlying causes of the revolt in Syria are the same as in the rest of the region. If the first event that started the ‘Arab uprisings’ took place in Tunisia on 18 December 2010, the revolt spread rapidly to other countries, in particular Egypt with the occupation of Tahir Square. December 2010 was the beginning of a political revolution across the region that sought to oust old corrupt elites. The unfolding of the revolutionary process took different forms in the various countries of the region. In Syria, Bashar al Assad refused to make any concessions and stepped up the repression. Unlike in Egypt and Tunisia there was no significant break in the ranks of the regime, which would have allowed an alternative to emerge from within the system that would have diffused the revolt while maintaining the country within a neo-liberal framework. After the Daraa protests, the regime escalated the repression across the country with the army and air force striking at towns that were in revolt and which had ousted the local representatives of the Assad regime. The local population had no choice but to organise to run their communities through the establishment of Local Co-ordinating Committees or Revolutionary Committees and to defend themselves against the military onslaught. The organisation of the military defence of the opposition to Assad developed into the loose network of Free Syrian Army. It is in this context that the Left should support the right of the people of Syria to defend themselves against the military assault of the Assad regime. The responsibility for the militarisation of the political uprising lies entirely with Bashar al Assad. Towards the end of 2012, there was over 50,000 dead and more than 500,000 refugees. But in 2013, these figures had escalated dramatically. The long drawn-out character of the military conflict is due to the fact that the opposition has only been able to get just about enough arms to hold off the Syrian army. These have been obtained by raiding depots, from defectors, purchasing a few through adjacent countries, all supplemented by a trickle of small-arms from supporters in the Gulf States who directed them mainly to radical islamists. Neither imperialism nor its allies in the Gulf have supplied the anti-tank or anti-aircraft guns necessary to effectively stop the assault by the pro-Assad forces. This is partly because they do not trust the opposition, and also because of the fear that the toppling of the Assad regime may re-ignite the revolution for political democracy which started in Egypt and Tunisia in 2011. The superior military resources from supporters in the Gulf States to the radical islamist organisations, such as Jabhat al-Nusra and other al-Qaida affiliates, is attracting volunteers and has given them an advantage over the Free Syrian Army. There should be no surprise that US imperialism and its allies such as Britain and France will want to subvert the uprising against the Assad dictatorship to suit their own strategic political objectives. There has been vigorous intervention by imperialism into every popular movement for democratic change since the fall of the Soviet Union in 1989, and well before that. But the Left should be vigorously relating to these movements for democracy, extending its solidarity and warning them of neo-liberal solutions and imperialist intervention. In the Middle East and North Africa, imperialism wants to back regimes that can ensure a supply of oil and to protect Israel as its most loyal regional ally. At the end of the day, the US, Britain and France would rather see a brutal dictator loyal to their interests in power rather than an independent, democratic and popular government. That is why they supported Saddam Hussein in Iraq for so long, made their peace with Gaddafi, and provided financial and military aid to Egypt. Since their military intervention in Iraq, the US and its allies have changed their tactics. The intervention was a military victory but the US and Britain were unable to achieve their political objectives. There are no US military bases in the country and the entire destruction of the Baathist regime has now left them with a government which is friendlier to Iran than to the US. Today, instead of seeking a total cleansing of the state in Syria, Obama wpuld prefer the ‘Yemeni’ solution: remove the main figurehead but leave the rest of the regime intact. In that way, things appear to have changed but actually remain the same. There would still be a strong repressive state able to prevent a movement for democracy overflowing in an uncontrollable manner and the country stays within the political and economic framework of neo-liberalism. Furthermore it maintains a ‘peaceful co-existence’ with Israel, as Assad senior and junior have done since 1967 when the Golan Heights were occupied. The deal to destroy chemical weapons, was negotiated after the regime used chemical weapons in the conflict, has been a disaster for the rebellion and a political coup for Assad. It has taken imperialist military intervention off the agenda and has legitimised the regime in a way that Assad could only have dreamt of a few weeks ago. He can now present his regime as complying with the wishes of the UN whilst conducting an all-out war against the rebellion and receiving all the arms he needs from Russia and its allies. The deal was also a lucky break Obama, who seized it with both hands to rescue his presidency as the intervention was just as unpopular in the US as it was in Britain. Of course, a military intervention is still a possibility, but not at the moment. The US, Britain and France are not alone in wanting as little change as possible in Syria. Russia is just as keen that the Assad regime is not ousted as it has its last naval base outside the former Soviet Union in Tartus. It also does not want the area to fall further under US political and economic hegemony. That is why it has been generously arming the Assad regime, allowing it to pound relentlessly the opposition held areas and to put the civilian populations under siege like the Russian army had done in Grozny. But condemning the Russian support for Assad cannot just be left to Russian socialists as John Rees, a leading member of the Stop the War Coalition and Counterfire, argues when he writes that ‘the best chance that the Syrian democratic movement has of success is if we successfully challenge our imperialists and Russian socialists and anti-war activists successfully challenge Putin’. As well as Russia, Iran is also backing Assad, and Hezbollah in Lebanon are sending over fighters to back the regime. Of course the Left and the anti-war movement in Britain and elsewhere must in the first instance call upon their own government not to intervene in Syria. The failure of Cameron to get backing in Parliament for intervention alongside the USA is a tremendous victory and vindication of the anti-war movement established 13 years ago in the wake of the 9/11 terrorist attacks in New York. But the Left and the anti-war movement cannot stay silent on the other foreign interventions backing the murderous Assad regime. Instead, it has to support the right of the people of Syria to determine their own future free from all foreign intervention. Unfortunately, too many on the Left while despairing at the horror of the unfolding conflict in Syria are failing to cast a critical eye on the situation or even to accept facts. The conflict is dismissed by some as just a proxy war between the US and Russia, and others that it is simply a civil war. In every ‘civil war’ there is a conflict between political and economic interests that is a class conflict just like there was in the Spanish ‘civil war’. As Clausewitz – who was no Marxist – put it, ‘War is the continuation of Politics by other means’. There is in Syria not just a political struggle for democracy which is part of the ‘Arab uprisings’, and a proxy conflict between US imperialism and a capitalist Russia, but there is also within the opposition to the Assad regime a struggle between the more progressive and secular elements – even if they have illusions in imperialism – and the radical islamist forces backed by some Gulf States. The latter conflict has at times taken a military form as they struggle for control of cities freed from the Syrian government. 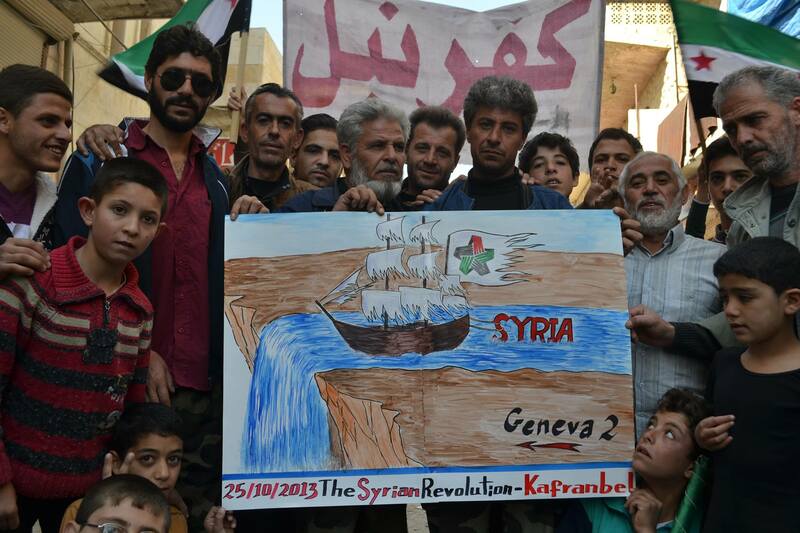 And there are of course small leftist and Marxist currents still in Syria fighting against Assad. There are too many credible reports about the more democratic functioning of some of the areas liberated from the Assad regime for these to be simply ignored. Instead, this should give us hope that a political revolution is still possible in Syria. One of the worst readings of Syria is by Slavoj Zizek who, in an article in the Guardian, describes it as an ‘obscure conflict’ where there are ‘no emancipatory forces’. This reading of the situation is far too reminiscent of Joseph Conrad’s ‘Heart of Darkness’, suggesting that Syria or other countries of the Middle East are a place of moral bankruptcy, wildernesses with ‘no emancipatory forces’. Zizek goes even further, but he is not the only one, when he writes that ‘Syria at least pretended to be a secular state’ implying that Assad is the lesser evil in the current conflict. This argument, which is demolished by Syria Freedom Forever,  is ‘campist’, that is supporting, or at least not being too critical of, regimes which are in conflict with imperialism. It is clearly argued by Rob Griffiths, General Secretary of the Communist Party, who ‘warned that tipping the military balance against President Bashar al-Assad’s regime would not only remove a critic of US foreign policy and the illegal Israeli occupation of Syrian, Palestinian and Lebanese land. It would also strengthen sectarian fundamentalists who – like their Saudi and Qatari sponsors – oppose democratic rights for women and religious minorities’. Another argument in justifying opposition only to US and British imperialism comes from Guardian journalist Seumas Milne. He argues that since the fall of the Soviet Union, a multi-polar world is a better place than one entirely dominated by US imperialism. Writing in the Guardian about the war in Georgia in 2008, Milne argued for ‘the necessity of a counterbalance in international relations that can restrict the freedom of any one power to impose its will on other countries unilaterally’. This line of argument also influences the Stop the War Coalition which put out a statement recently that ‘continued war threatens to change the face of the Middle East, by weakening the influence of Iran through attacking its allies such as the Syrian government and Hezbollah in Lebanon’. No-one has yet demonstrated that a multi-polar capitalist world is a safer or better place than a uni-polar one dominated by US imperialism. The problem with this approach, described by some on the Left as ‘campism’, is that it looks at the conflict in Syria through a dynamic of conflicts between states rather than that of a social and economic conflict, in other words of class interests. None of the regimes or governments in the Middle East plays a ‘progressive’ role. All of them, to some extent or another, are repressive and are pushing the neo-liberal agenda, rolling out privatisation, failing to back the Palestinians, and each playing a part in the ‘war against terror’. Tariq Ali also fails to look at the dynamic of the process and ignores the facts. In a recent article, he correctly argues that ‘mass uprisings on their own (do not) constitute a revolution’ and that the ‘mass uprising was genuine and reflected a desire for political change’, but he ignores the current internal struggles in the opposition and the reports from areas freed from the Assad regime. He denies that there is even a revolutionary process when he writes about Egypt that ‘the ancient régime (the army) is back in charge with mass support. If the original was not a revolution, the latter is hardly a counter-revolution’ and he argues against positions that no-one on the Left holds such as that ‘the idea that the Saudis, Qatar, Turkey backed by NATO are going to create a revolutionary democracy or even a democratic set-up is challenged by what is happening elsewhere in the Arab world’. John Rees at least argues that ‘although there was an internal dynamic to the Syrian revolution it was increasingly prey to imperialist intervention which was both corroding the revolutionary process and increasingly shaping the direction of events in the region’. It is indeed true that the conflict has been militarised, but this is not just the responsibility of imperialism. The Assad regime, backed by Russia, has been relentless in its attempt to crush the opposition. But that in itself is not a reason to believe that the original character of the Syrian revolution has been totally eradicated. As Gilbert Achcar puts it in his interview, ‘there is an ongoing revolutionary process throughout the region, which, like any revolutionary process in history, has ups and downs, periods of advances and periods of setbacks – and sometimes ambiguous periods’. There has obviously been a massive set-back in Egypt with the recent military coup ousting the Morsi government. The retreat in the revolutionary process is also evident in Syria with the enduring military conflict between Assad and the opposition, in which Assad seems to be gaining ground and which if nothing changes, he will probably win with his army and air force amply supplied by Russia. So how should the Left and the anti-war movement in Britain and elsewhere respond. Simply opposing Western intervention and stating as, the Stop the War Coalition does, that ‘the solution in Syria cannot lie in further militarising the conflict, but in attempts to achieve peace through negotiation’ is not sufficient as it ignores the future of Assad who has been described by the Coalition as having an ‘appalling record on human rights’. One of the main opposition group, the Syrian National Council, has agreed to join a peace conference in Geneva if certain pre-conditions are met, in particular that Assad should have no role in the future of the country, but also that there should be an end to the fighting, the withdrawal of Syrian armed forces from major cities and the urgent introduction of humanitarian aid. But participation in peace talks is contested by many others in the opposition who reject the dialogue in Geneva while Assad continues to commit war crimes in Syria. The Stop the War Coalition was established 13 years ago not just to oppose Western intervention in Iraq and Afghanistan, but also to defend democratic rights in Britain and oppose racism and islamophobia. The anti-war movement in Britain should not take a view on who to back in Syria but it should support the right of the people of Syria to fight for their democratic rights, and to be allowed to determine their own future free from all foreign intervention, that of Britain first of all but also that of the US and Russia. The movement should also continue to denounce Assad for his ‘appalling record on human rights’. The Left in Britain should also go further than what a broad-based anti-war movement can do. It should extend its solidarity to all those fighting for democracy in Syria, support their right to take up arms to defend themselves against Assad and to obtain the arms from wherever they can without conditions. The Left should clearly call for the ousting of the Assad regime and for a free and democratic Syria. The Left’s support for the opposition should not be done uncritically. They should be warned of the dangers of imperialist intervention and of backing neo-liberal economic and political solutions. Our warmest solidarity should be extended to those small forces on the Left in Syria such as the Revolutionary Left Current. But in the face of the desperate humanitarian crisis, the Left should also support material aid going to the refugees through appropriate organisations. This should not be dismissed as charity, but as an act of solidarity just like material aid for miners during their year-long strike in Britain or like the Viva Palestina aid convoys. 3 Comments on The crisis in Syria today – how should the Left respond? I broadly agree with this article, but I think it underestimates the strength of the islamist forces in the opposition. I also wonder if it is right to imply that the turn to a military struggle was the only possible response to Assad’s military offensive. This turn facilitated the growth of the reactionary forces in the opposition, as it led to a withering of the mass movement against Assad. Suggesting that this militarisation was inevitable leaves a rather pessimistic prognosis for similar struggles in the future. Finally, an account that raltes what has happened in Syria to the Arab Spring in general needs to examine Libya (and possibly Bahrain) as well. Is there not a fundamental contradiction in suggesting that any “stop the war” movement should support any group “to take up arms” against an oppressor? I am not sure how any individual or group should respond to such situations. But, it seems to me after these sad global situations, following Iraq, that perhaps the fundamental question is something like: what does/can one do if A threatens your child? Or even: if A threatens one’s family or one’s “home”, is the use of force, up to killing, justified to protect that family or “home”. It seems to me there needs to be a “critical mass” on both, or all, sides committed to talking things through, preferably with a skilled mediator. This scenario demands tremendous trust and skills – those skills are what we should all be striving to learn and to foster, in order to develop a “sustainable” way of working things out for the future of humanity.